The show went off pretty well on friday. Attendance was lower than previous shows. I believe the inclement weather kept all but the most adventerous patrons from driving in. Family and friends "have" to show up, so they provided a number of warm bodies that night. Above is my nephew Jason, and his girlfriend Alison checking out my wall. 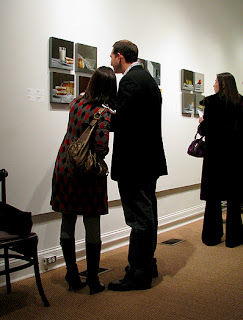 Here are two patrons admiring Karens' work. Twinhouse is such a beautiful space. It's always exciting to see your work hanging there after having it stacked around the house for weeks prior to a show. The strip of businesses that include the gallery had been bought out by developers, and it looked as though the gallery would be demolished in the upcoming months. Now we've heard that there has been a reprieve, and it will remain in its' current location for the next 18 months to two years. And last, but not least, a couple of patrons discussing the merits of "Business Opportunity in Monkey Town". Jeff Cohens' work looked great. The show included one of his most beautiful water towers. All in all, it was a good night. I sold two paintings, and Karen sold one. I haven't spoken with Jeff since that night, and so aren't sure if he has had any sales as yet. Now it's on to the other galleries. I've got a good start on my second large Milkshake Mixer destined for Stricoff. I'll put up an in progress image soon. 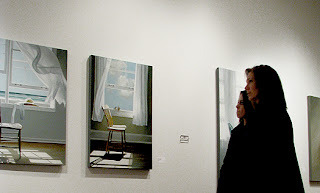 Before I end this post I'd also like to thank Karin Jurick for sending me these images from the show. I took my camera, but didn't take a single shot. Well, we've finally reached the end. This is the final piece for the winter show at Twinhouse. I'm not exactly sure what this "little kettle" is, but that's how I've named it. This may actually be a creamer. I just like the shape, and how its' surface reacts to light. I also felt that my contribution to the show needed one more refltective piece. All the paintings have been delivered, and are at the gallery being hung. Susan always does a great job of positioning the work, and I'm looking forward to seeing how she presents the paintings this year. It looks as though the weather will not be cooperating. It hasn't rained a drop here in Atlanta for the last nine months, but it will be raining on friday, with a chance of thunderstorms. Hopefully the hardier gallery patrons will brave the elements to attend the show. Anyone interested in a pre-show purchase of this painting can find contact information to the gallery by clicking here. 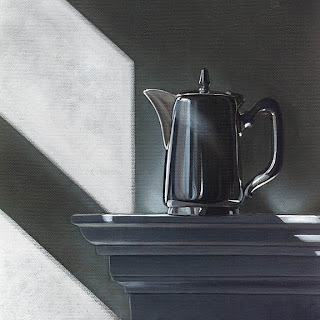 If you'd like to see all the completed work, for Karen, and myself, you can either click on the "Upcoming 2008 Twinhouse Show" link or click here. As I said in my last two posts, "heavily weighted toward the subject of bread". 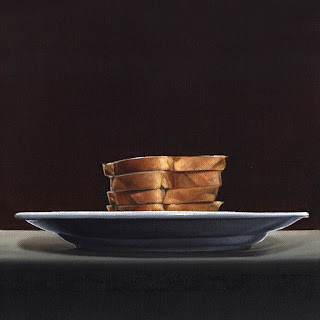 Sliced Bread No.2 is the final bread painting, and the last of the paintings that were previously shown at Twinhouse. It is a larger piece than the others in the group, sized at 12 x 12. 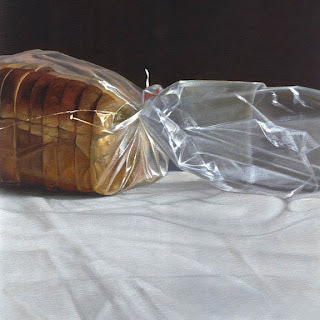 This is, in my mind, one of my best bread paintings. If you're interested in a pre-show purchase of this painting you will find contact information to the gallery by clicking here. 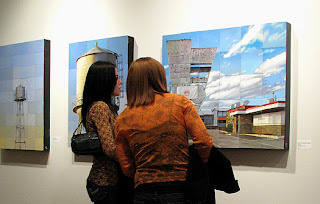 If you'd like to see all the completed work, for Karen, and myself, you can either click on the "Upcoming 2008 Twinhouse Show" link or click here. As I said in a previous post, "heavily weighted toward the subject of bread". 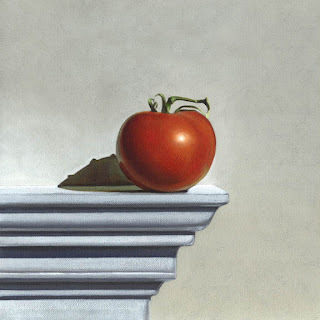 Like the Tomato on the Edge, this particular painting has been at Twinhouse since the fall. I've included it for the same reasons I listed with the Tomato painting. Hopefully this will be seen by someone who is unfamilar with it, and experience love at first sight. 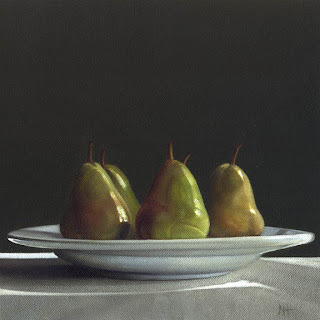 Here is the second of the two pear paintings for the show at Twinhouse. I'll be putting up a painting a day to get these all in before the 22. If you're interested in a pre-show purchase of this painting you will find contact information to the gallery by clicking here. If you'd like to see all the completed work, for Karen and myself, you can either click on the "Upcoming 2008 Twinhouse Show" link or click here. My portion of the show at Twinhouse this year is heavily weighted toward the subject of bread. I'm hoping that I haven't tipped the scale too far in that direction. It's been a popular theme in the past, and maybe there is still life left in it. No pun intended. If you're interested in a pre-show purchase of this painting you will find contact information to the gallery by clicking here. If you'd like to see all the completed work, for Karen and myself, you can either click on the "Upcoming 2008 Twinhouse Show" link or click here. 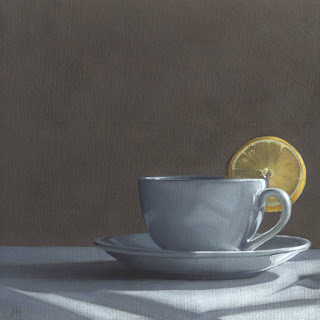 Next in the line up for the winter show at Twinhouse is this little cup. I hadn't done a tea cup painting in quite a while, and thought it was time. I have to say it was really fun to paint, and I think it turned out well. I'm intrigued by white ceramic, and have been trying to master that creamy translucent surface for years. I'm getting there, but haven't got it yet. There are a lot of subtle layers, colors, reflections, and highlights in this material, and it's been a challenge to capture those qualities properly. I'm hopeing one day to fully realize those in a painting, and am looking forward to that learning process. Those who may be interested in a pre-show purchase of this painting can find contact information to the gallery by clicking here. If you'd like to see all the completed work you can either click on the "Upcoming 2008 Twinhouse Show" link or click here. I'm going to be completly honest with all of you, and confess that this particular painting has been at Twinhouse since the fall. It will be included in the grouping for the winter show, because: 1. It will help flesh out my portion of the gallery and, 2. I really like it. I felt that I nailed the tomato, and I love the composition. It was in fact one of my favorite paintings of last year. I don't always "see" my paintings as others do, and often miss the mark. None the less, I think it's pretty good. No, really good, and am looking forward to seeing it with the other pieces on the wall. I hope you can forgive my pride. The title of the Twinhouse show is Trifecta, indicating the there will be three artists represented. Karen and I are two of the trio, and Jeff Cohen is the third. 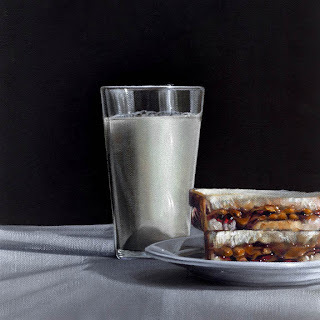 He will be showing a number of his "fragments" paintings. 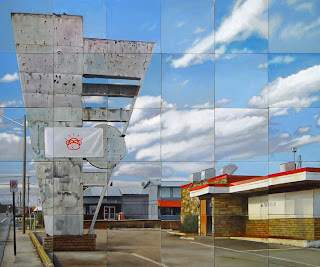 He creates these by painting individual plywood panels separately, then mounting those panels to a plywood box. The finished painting is then covered with a beeswax preparation. We spent the evening with Jeff and his wife Leslie (also an artist) a couple of days ago, and saw a number of his completed paintings . . . Jeff's going to have a good show. I've suggested that he put up all of his completed paintings on a temporary website, so the entire show could be viewed by those who may be interested in making a pre-show purchase. He liked the idea, but he's in a bit of a crunch to finish his paintings, and wasn't sure if he would have the time. If he can swing it, I'll put a link to those paintings in a future post. They're really beautiful. I've got my small paintings finished for the show, although they are not all on my website just yet. I should have them up in a day or so. 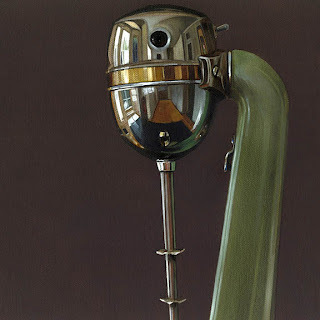 Now I will begin working on a new piece intended for Stricoff Fine Art Ltd. Jeff Stricoff was interested in another Milkshake Mixer (yay! ), so I'll be working on that for a while. I may post some "in progress" images for it. Anyone interested in a pre-show purchase of the Tomato painting above can find contact information to the gallery by clicking here. If you'd like to see all the work completed so far you can either click on the "Upcoming 2008 Twinhouse Show" link or click here. 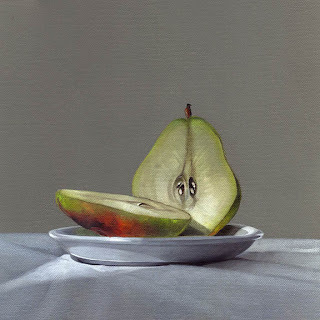 I haven't had much luck selling pears in the recent past, but the fact is that I love painting pears, so here is the first of two pear paintings I've done for the Feb. 22 show at Twinhouse. Actually I stole this image from Karen, who had used it in her painting Symmetry, which she will have at the same show. It will be interesting to see if anyone notices. Those who may be interested in a pre-show purchase of this painting can find contact information to the gallery by clicking here. If you'd like to see all the work completed so far you can either click on the "Upcoming 2008 Twinhouse Show" link or click here. Moving on to the next piece from the up-coming Twinhouse show Feb. 22. I love this milkshake mixer from Hamilton Beach. The motor housing is especially fun to paint. If things work out, I'll be able to paint it a lot before people get sick of seeing it. This is the second incarnation. The composition is similar to the first, only much smaller, and sans the cup. 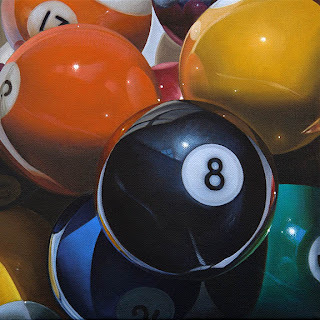 Anyone interested in a pre-show purchase of this painting can find contact information to the gallery by clicking here. We picked up the invitations for the show yesterday at the gallery, and they look really good. It's a nice design, and the reproductions of each artists work is spot on. I may scan it, and put it up later, I'm not sure. If you'd like to see all the work completed so far you can either click on the "Upcoming 2008 Twinhouse Show" link or click here. With the exception of the Cherry Can, the paintings for the show at Twinhouse will reflect popular themes and sizes from the previous year. I've received quite a few requests for that subject matter, and I aim to please. Once the show is hung I'll be returning to some of the larger pieces I had flirted with at the end of 07. If you would like to make a pre-show purchase of this painting you can find gallery contact information by clicking here. If you'd like to see all of the paintings completed so far you can do so by clicking here.